This is my GSD, “Angus”. He is 10 years old and still has the drive, play and love of life as he did as a pup! He is truly one of the great good will ambassadors of this breed. I have never seen him be anything but friendly and loving towards everyone, young and old alike. Looking back on all of our years together I can honestly say that dogs really are the only true love that money can buy! 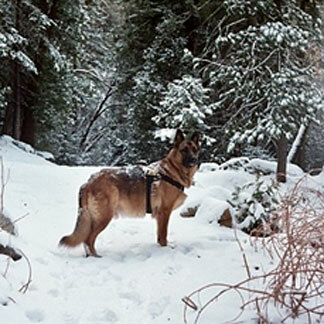 Hello May, and thank you so much for sharing your great story about your wonderful German Shepherd Dog Angus. And I do agree with your statement - "I can honestly say that dogs really are the only true love that money can buy!". Hear, hear! It's always so nice to hear about all our senior German Shepherds out there, their lives, families and what they have done over the years. I wish more people would share their German Shepherds lives with us - I love reading the stories and I’m sure I’m not the only one. And I'd like to take the time to say thanks to all our visitors for reading along all about Angus with us. If you get the chance, please come back often to see what else is going on in our growing German Shepherd community. BTW, please tell us also exactly what you think about the above story by leaving some interesting comments below. "How do I do that? ", you might wonder. It's actually pretty easy to do - just click on the link below that says "Click here to post comments" and then type in your thoughts about the stories that you have just read. And if you want to read what others have said you can do that too at the same place. So now it's all up to each of you. Share with us all the information as you'd like, read the stories of others, watch a few German Shepherd videos and see what experiences others have had with their own German Shepherd Dogs. Thanks for visiting us here at Total German Shepherd. "I can honestly say that dogs really are the only true love that money can buy!". Hear, hear!" Well said TotalGerman Shepherd.com.